From what I’ve heard, there is more than one way to skin a cat. I can’t imagine why anyone would want to skin a cat. What I can imagine though is why anyone would want to make tuning drums a simpler task, or improve the accuracy of our tuning attempts. What’s this got to do with skinning cats you may wonder… Well, as it turns out there is more than one way to tune a drum too. A few deductions can be made after writing this review of Resotune II. Tuning drums can not get simpler than this. Unless you’ve already developed some serious drum tuning skills, you can benefit from this device. In addition to just functioning as a tuning aid, the Resotune II can guide you in tuning just about any voicing imaginable, recall past tunings, copy other drummer’s tunings and get any drum sounding it’s best. Easily overlooked is how interesting a device such as this this can be. 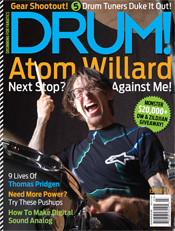 Reading and comprehending the articles mentioned above will give you academic knowledge about how drums work. Reading them and using the Resotune II will give you practical understanding of how drums work. This device is an ideal addition to any studio, drummers that like to experiment or need multiple tunings for different situations or just about any drummer who has yet to develop their tuning skills. CompactDrum’s.com gives the Resotune II our highest recommendation! Last, but not least, the Resotune II uses easily the most intriguing method among all the tuning products I encountered. The device identifies pitches, but unlike the Tune-bot, does so without requiring the strike of a drum stick or fingertip. Instead, the Resotune II utilizes a pair of speakers and an on-board microphone to broadcast a series of notes in scale, and then locates the lowest fundamental pitch of the drum at its current tuning. Those readings represent the target note for the user to dial in at each lug. That’s actually a fairly reductive summary of the machine’s function, but this is an incredibly complex device, and I’m essentially focusing on the gist for the sake of space. For a little more insight into the basic process, let’s go through the steps of a very rudimentary tuning. First, the Resotune, which is a large and heavy machine, is placed partially on the rim and partially above the head of a drum. It rests fully on the rim, but is suspended over the head with an included pair of exchangeable wood dowels that rest on the opposite side. Resting on the rim, the device is centered in front of a tension rod. When the user presses the “Find Both” button (the first step in total drum tuning), the machine whirs to life, and starts emitting a low, buzzing tone, eventually moving through a few scales in an attempt to find the lowest fundamental resonating note of both the drum and the targeted lug. Before we move on, I want to say that the tone produced by this device was awesome. It sounded a little bit like a synth soundtrack for an early ’80s sci-fi movie. I understand that it was simply the most effective choice for the job, but it cracked me up every time, and terrified my wife. Moving on. Once the pitches have been identified, the process can be repeated at each lug. Additionally, the Resotune II offers a “Clear Lug” feature, which references a selected pitch, and indicates which direction the tension rod will need to be turned to find that pitch with a series of lighted arrows. So, let’s talk results. Simply put: the Resotune II gave me the best, most consistent sound every single time. It helped me find a clean, even note on every drum with uniform response from in front of each lug. It was also the most labor intensive process required by any of the five tuning aids, but I was very impressed with the final sound. Additionally, the “Drum Note” displayed during the “Find Both” process was very helpful in creating musical relationships between multiple drums. The Resotune II is capable of much more – including a great “Save Note” feature – but it, like the rest of the devices I checked out, was not without its flaws. As I mentioned above, the full tuning process took the longest of any option. Plus, at only slightly smaller than my size 12 shoe, it’s not very portable. I think the Resotune II’s best application would be in a studio where crystal clear tones with little to no muffling are needed. Beyond that, I will say that I feel like I learned a lot about how my drums sound the most natural after using this device. That was well worth the effort. Pros: Extremely accurate results; great for finding relationships between multiple drums; “Save Note” feature makes recalling previous tunings easy; lots of additional functionality. Cons: Large size; time consuming; not extremely intuitive (although, the Resotune’s creator is happy to answer any questions); requires a very quiet environment.